Cooking a turkey is enough to give any cook, seasoned or otherwise, pause. After all, such a large piece of meat seems more like an investment than a main dish. But turning out a succulent Thanksgiving turkey only requires a little patience, know-how, and an accurate kitchen thermometer. You’ll have to provide the patience and the thermometer, but we can help with the know-how. 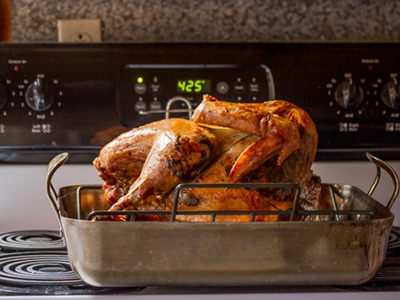 Our favorite roasting method is the turned roast, which yields a beautifully browned, intensely flavorful bird. By exposing the thighs to the heat reflected off the hot oven roof and keeping the breast turned toward the cooler oven walls, the dark meat cooks fully while the breast remains tender and juicy. We give our turkey a flavor boost by stuffing chopped herbs beneath the skin. This step adds to the work involved, but we think the result is worth the effort. Because the turkey must be flipped from side to side, a bird that weighs less than 15 pounds is easiest to handle. The pan or rack must be well-oiled. If the turkey is browned to your liking but the internal temperature is still quite low, turn the oven down to 300°F, place the bird breast-side up, spoon pan juices over the breasts, and cover with foil until done. We stuff the turkey with aromatic vegetables and herbs since the cavity never holds enough stuffing to suit our taste. For more Thanksgiving recipes and a detailed lesson on how to truss a turkey, visit The Joy of Cooking blog. Gently loosen the skin around the neck cavity and breast with your fingers and carefully work the herb mixture underneath and then back toward the thighs. Spread as evenly as possible beneath the skin. Turn the turkey onto its side. If it topples over, prop it up with crumpled aluminum foil. Roast for 30 minutes. Remove the turkey from the oven. Wearing silicone gloves or heavy-duty oven mitts to protect your hands, carefully grasp the turkey at both ends. A set of sturdy tongs will help to turn the turkey with relative ease. Turn it onto its other side, again propping it up with foil if necessary. Spoon pan drippings on all of the exposed skin, then roast for 30 minutes. Turn and baste twice more so that the turkey roasts twice on each side and until a thermometer plunged into the thickest part of the thigh registers 170°F, 10 to 30 minutes more. Remove the turkey to a platter and let stand, loosely covered with aluminum foil, for 20 to 40 minutes before carving. The center of the inner thigh muscle should rise to 180°F during this time. Recipe excerpted from JOY OF COOKING by Irma S. Rombauer, Marion Rombauer Becker, and Ethan Becker. 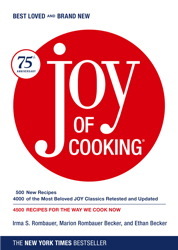 Copyright © 2006 by Simon & Schuster, Inc. Excerpted with permission by Scribner, a Division of Simon & Schuster, Inc.
Irma Rombauer self-published the first Joy of Cooking in 1931 with the small insurance payout she received after her husband committed suicide during the Great Depression. Suddenly, society wives who used to enjoy a kitchen staff no longer had the money to employ them and began cooking for themselves. The instruction "stand facing the stove" was a bit more pragmatic than we realize. In 1936, the first commercial edition was published by Bobbs-Merrill. Marion Rombauer Becker, Irma's daughter, joined the Joy dynasty and revised and updated each subsequent edition until 1975. That edition was the first after Irma's death and was completely Marion's. Her son, Ethan Becker, has returned the book to the family's voice, revising the 1975 edition for the 75th Anniversary Edition.